What do one hundred sunbathing snails have in common with ten crabs in inner tubes? Check out this mirthful counting book with a focus on feet. If one is a snail and two is a person, we must be counting by feet! 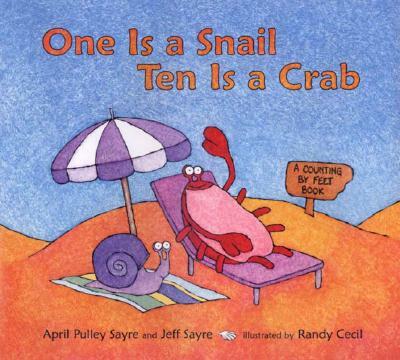 Just follow the sign to the beach, where a bunch of fun-loving crabs, lounging dogs, gleeful insects, and bewildered-looking snails obligingly offer their feet for counting in a number of silly, surprising combinations - from one to one hundred! April Pulley Sayre and Jeff Sayre are a husband-and-wife team who lead ecotours and travel extensively to study, photograph, and videotape animals in the rain forests of Panama, Madagascar, and Ecuador. They also speak at schools, botanical gardens, zoos, and nature festivals. Together they wrote a natural history book for adults. Jeff Sayre is an ecologist specializing in native plants and birds. April Pulley Sayre is an award-winning author of more than forty books for children. The Sayres love to brainstorm and laugh together - which is how the idea for ONE IS A SNAIL came about. Randy Cecil graduated from the Rhode Island School of Design and is the illustrator of numerous books for children. He says of ONE IS A SNAIL, "It was great fun to figure out how these strange creatures would react in all these different combinations. Crabs seem to have the best time together!"